Like potato pancakes—only better— gluten free rosti is quick to make and deeply satisfying for breakfast, a first course, or a light meal. Peel the cylindrical top part of the squash and cut into large chunks (keep the round seed cavity for another use). Transfer to a food processor and grate with the grater attachment. In a large bowl, lightly whisk 1 egg, then mix in the grated squash, onion, cornstarch, and a pinch each of salt and pepper. Line a plate with paper towels. Heat a sauté pan over medium heat until hot. Add enough olive oil to thinly coat, then heat until hot but not smoking. Place scoops of squash mixture (about 3 tablespoons each) in the pan, gently flatten, and cook until crispy, about 4 minutes per side. Transfer the rosti to the prepared plate and repeat with the remaining squash mixture, adding and heating more oil as needed. Keep warm. Add a small amount of olive oil to the same pan over medium heat. Crack 2 eggs into the pan, season with salt and pepper, and fry until the edges are crispy and the whites are set. Reserve on a plate. Repeat with the remaining 2 eggs. 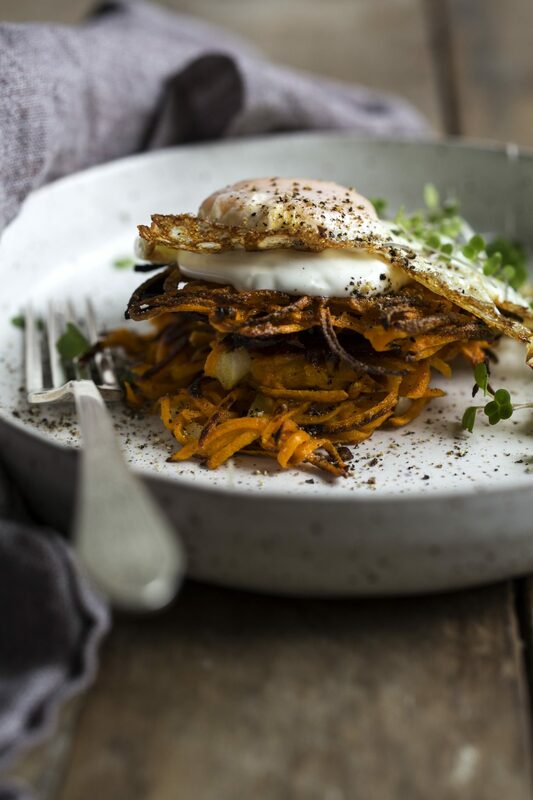 Divide the rosti among 4 plates, top with a dollop of sour cream and a fried egg, and serve.